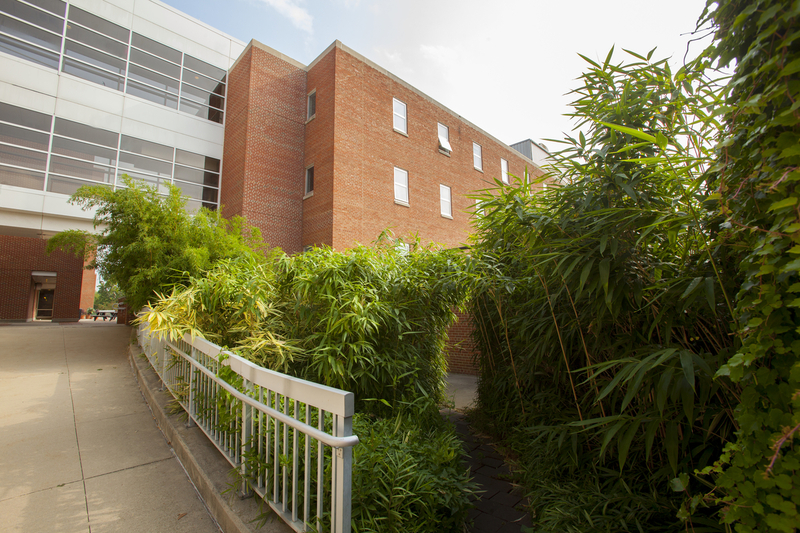 The Bamboo Garden was designed and planted by Martin Quigley, former horticulture professor at The Ohio State University, and was made possible by Bill Hendricks of Klyn Nurseries, who donated the plant materials for the garden. The enclosed space of this site provides a perfect way to enjoy some of the more aggressively spreading bamboos while preventing them from invading the rest of the gardens. The garden showcases the wide range of bamboos hardy in central Ohio. Bamboos are lovely plants that deserve to be planted more widely in our gardens. As this collection demonstrates, bamboos include a wonderfully diverse range of sizes, leaf shapes, and colors. Tall bamboos can provide evergreen screening and wind breaks, dwarf bamboos are excellent ground covers for difficult sites, and all bring a unique tropical Asian feel to the garden. Bamboos are generally tough, drought-tolerant, adaptable plants, and have been completely pest and disease free in our garden. When planting a bamboo, be sure to plan for its eventual mature size. A bamboo may take up to ten years from first planting to reach its final height. This also means many of the larger bamboos in our collection have not yet reached their mature size. Many bamboos spread aggressively, so plan ahead before placing them in the garden. Bamboo spread by rhizomes (underground stems) that grow continuously during the warm part of the year. These rhizomes then send up new shoots (called culms) once a year, in the spring or early summer. Here are some tips to keep bamboos where you want them. Choose your varieties carefully: There are two main types of bamboos: clumpers and spreaders. Clumping bamboos do not typically invade the rest of your garden, but only a few are winter hardy in central Ohio. Many spreading types of bamboo can be extremely invasive, but some stay fairly compact. Plant in root barriers or containers: Bamboo rhizomes grow close to the surface of the ground, so a barrier (such as plastic edging) extending 2 feet into the ground helps keep the bamboo from spreading. Any rhizomes growing up over the top of the barrier will need to be pruned. Dwarf bamboos can also make lovely additions to container displays, but probably will not overwinter outside in the container. Selective pruning: In spring you can cut down any shoots coming up where you don't want them. Since bamboos only send up new growth once a year, this method is not as time consuming as you might think. Lawn mowing: A clump or hedge of bamboo planted in the lawn where you mow on all sides can be contained – the regular mowing kills any shoots that attempt to grow out into the grass. Grows to 3–6 feet with a 2–5 feet spread. Slightly invasive. Prefers sun to part-sun. No cut back in spring needed. Grows to 3–4 feet with a 2–5 feet spread. Not invasive. Prefers part-sun to shade. No cut back in spring needed. Grows to 8–20 feet with a 4–10 feet spread. Very invasive. Prefers sun to part-sun. No cut back in spring needed. Grows to 5–20 feet with a 5–13 feet spread. Very invasive. Prefers sun to part-sun. No cut back in spring needed. Grows to 15–25 feet with a 3–6 feet spread. Very invasive. Prefers sun to part-sun. No cut back in spring needed. Grows to 1.5–3 feet with a 2 feet spread. Invasive. Prefers sun to part-sun. Cut back in spring is recommended. Grows to 1 feet with a 5 feet spread. Very invasive. Prefers sun to part-sun. Cut back in spring is recommended. Grows to 1.5–2 feet with a 3–6 feet spread. Very invasive. Prefers sun to part-sun. Cut back in spring is recommended. Grows to 8–11 feet with a 8–11 feet spread. Moderately invasive. Prefers sun to shade. No cut back in spring is needed. Grows to 5–8 feet with a 3–13 feet spread. Moderately invasive. Prefers part-sun to shade. No cut back in spring is needed. Grows to 3–6 feet with a 2–5 feet spread. Moderately invasive. Prefers sun to shade. Cut back in spring is recommended.